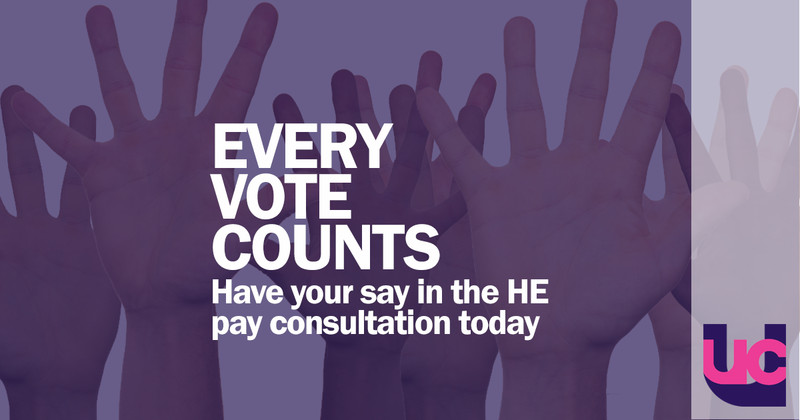 You are asked* to make an important decision about the 'final' pay offer of a 1.7 percent salary increase for higher education staff in 2017/18. Recent changes in the law are designed to take decisions about what the union does out of the hands of you - the member. Whatever your views, please read this message carefully, and make sure you use your democratic right to vote. The union's higher education committee (HEC) believe that the 'final' offer of 1.7 percent is the best achievable through negotiation, in other words: achieving a further improvement is likely to require you to take industrial action. While a 1.7 per cent pay rise is significantly above recent awards for comparable staff in the public sector like teachers, doctors and nurses, it is substantially lower than inflation which rose again to 2.9 percent last month. As part of their 'final' response the employers also proposed further joint work with the unions on addressing the gender pay gap. However, no meaningful progress at all was made with other important issues raised by the union such as the use of casual contracts, rising workload and stress, and our claim for minimum rates of pay for external examiners. When you click the link you will be asked two questions. First, whether you wish to accept or reject the employers' final offer. Second, whether in the event members reject the offer, you would be prepared to take action either in the form of strikes or as part of other types of action called 'action short of a strike' (ASOS). All forms of industrial action are a breach of contract. Both strikes and ASOS can be legally penalised by the employer by withholding up to 100 percent of your pay for the duration of the action. It is now unlawful to take industrial action without a turnout of more than 50 percent in a statutory ballot, even if the majority of members who vote, support action. It is therefore vital that the union knows your strength of feeling on this offer. PS. You can find full details of the employers' offer here.